Tongwancheng, capital city of the Da Xia Kingdom (407–431) founded by the Huns’ descendents, was situated at the junction of present-day Inner Mongolia Autonomous Region and Shaanxi Province. It commanded a strategic position connecting China’s eastern and western parts. It was also the intersection of the country’s nomadic culture and farming civilization. During the period of the Sixteen Kingdoms, the Da Xia Kingdom swept the battlefields, leaving behind many legends in history. Tongwancheng witnessed the tides of national integration and historical progress for more than 1,600 years. In his interview with a CSST reporter, Xing Fulai, captain of the Tongwancheng excavation team and a research fellow from the Shaanxi Academy of Archaeology, took the site as an example to explain how history can be restored through the investigation of buried or damaged ruins. CSST: The existing Tongwancheng site is composed of outer walls and an inner enclosure. The inner enclosure is divided into the western city and eastern city. Are we able to determine whether these constructions were built at one time or built in succession? Has archeological work revealed their relationship? Xing Fulai: The excavation of the Tongwancheng site started in 2002. We have found that the eastern and western cities stood in the southeastern part within the outer walls. The western city is better preserved than the eastern city. There were moats outside the two cities. After looking at the conditions of the moats and the characteristics of the packed earth, we believe the moats were built for city defense, and no water was stored there. At the same time, there are bastions outside the two cities. In addition to defense, the hollowed bastions also served as warehouses for grain, firewood and weapons. Archaeological drilling and excavation proved that the western city was the inner city of Tongwancheng at that time, and the eastern city was built later than that. The two cities stand together by sharing a city wall. However, they are differentiated from each other in terms of area, length, width and height of enclosure as well as size of bastions. These two constructions were not built at the same horizontal level. Their colors and densities of packed earth were remarkably different. CSST: The construction of the large-scale eastern city in Tongwancheng demanded a stable political situation and strong financial resources. How did they build such a massive construction again during wartime? 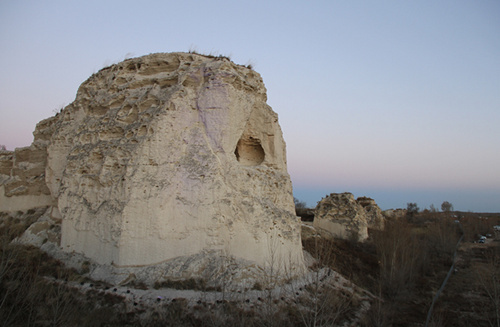 Xing Fulai: Historical documents, such as Zi Zhi Tong Jian, Jin Shu and Song Shi, have recorded that the Tanguts lived in Qinghai and southern Gansu during the Sui and Tang dynasties (581–907). They migrated from their homeland to the eastern Ordos region under pressure from the Tibetan Empire. Some Tanguts settled down around Xiazhou and formed the Pingxia Tribe. Its leader Tuoba Sigong contributed in the suppression of the Huang Chao Rebellion. The Tang court established the Dingnan circuit based in Xiazhou and appointed Tuoba Sigong as the military commissioner. He was allowed to bear the imperial family name Li. In 881, Tuoba Sigong set up a separatist regime, which became the predecessor of the Western Xia Dynasty (1038–1227). From the late Tang Dynasty (618–907) to the Five Dynasties and Ten Kingdoms Period (907–960), there was an era of political upheaval in which various heroes emerged to fight for power. The Dingnan circuit, despite its acceptance of the Tang court’s appointment, was truly a separatist regime. The stability of its political power and the strength of its financial resources were suitable for building these constructions. Also, Tongwancheng was the Xiazhou’s seat of local government. The complex in its eastern city was associated with the Dingnan Circuit. The main building was constructed by the Dingnan Circuit during the time span from the late Tang Dynasty to the Five Dynasties and Ten Kingdoms Period. The construction time of the eastern city coincided with that of the main complex. CSST: In recent years, it is said that archaeological discoveries have confirmed that Helian Bobo built the western city while the eastern city was constructed during the time span from the late Tang Dynasty to the Five Dynasties and Ten Kingdoms Period. Can we say that we have basically clarified the history and layout of Tongwancheng? Xing Fulai: That’s right. The western city started construction in 413 and its palace was completed in 418. After more than 400 years, the civil palace and other architectures collapsed or were seriously damaged. Connected to the main city wall by semi-circular curtain-walls was a type of area known as a wengcheng, which contained earthenware jars that resembled people. We found Sui and Tang tombs in the soil when we excavated the wengcheng outside the western gate of the western city. Also, the gate of the wengcheng was sealed with compressed earth blocks after its collapse. These finds indicated that this wengcheng was abandoned in the Sui and Tang dynasties and turned into a remote area where people buried dead bodies. At other excavation sites in the western city, we found that the accumulated layers over Tongwancheng were about 5 meters thick, in which the layers of the Tang Dynasty were 2 to 3 meters. This was solid evidence that Tongwancheng had a large population and saw a lot of activity in the Tang Dynasty. Because the western city was largely damaged, it was reasonable to build a new city based on its eastern wall. Thus, as the capital city of the Da Xia Kingdom, Tongwancheng only had the western city and the outer walls at the initial construction stage. The eastern city didn’t exist at that time. The Chaosong Gate, Fuliang Gate and Pingshuo Gate recorded in the historical documents referred to the western city’s southern, western and northern gates respectively. The reason why we have failed to identify the recorded Zhaowei Gate may be attributed to the construction of the eastern city. CSST: Ancient tombs provide valuable materials to understand and study the living conditions, funeral customs and economic conditions of our ancestors at that time. What are the characteristics of the ancient tombs around the Tongwancheng ruins? What materials have these ancient tombs supplied for studying the cultural chronicles of the ancient northern region and the era it belonged to? Xing Fulai: Between 2011 and 2012, we excavated 40 ancient tombs around the site, and initially figured out their eras, shapes and structures. We also have made an evolutionary sequence for these tombs. The continuation of the tombs around Tongwancheng was mostly consistent with Tongwancheng’s period of existence. We have found no epitaphs or relics with written words that can be dated back to the time prior to the establishment of Tongwancheng or later than the destruction of it. It is worth mentioning that in 2011, the excavation team discovered a tomb from either the late Northern Wei Dynasty or the Western Wei Dynasty four kilometers away to the south of Tongwancheng. The murals in the tomb included a sun with a three-legged golden crow and a moon with a white rabbit making medicine, which has confirmed the mythology of the ancient Chinese about the sun and the moon. Patterns of people, sheep and trees were also found in the murals. The most interesting thing was a house appearing alongside the image of the tomb owner on the wall facing the entrance to the tomb. This palace-like house conforms to the architectural style of the tomb. The pillars and arched doors were engraved on the facade of the door and painted. The tomb walls were all painted with colorful and exquisite murals whose content was mainly religious. The lips of the characters and animals on the murals were outlined in red. On the lower right side of the tomb interior, there is a man, who was supposed to be the tomb owner, sitting on a chair. Five monks beside him stood with lotus flowers in each of their hands. Beside them stood a Sogdian. Sogdia was an ancient Iranian-speaking civilization in Central Asia. Renowned in Eurasia for their outstanding ability to do business, the Sogdians were active in the exchanges along the Silk Road from the Eastern Han Dynasty to the Tang Dynasty. CSST: What types of artifacts have been unearthed at the Tongwancheng site? What are your expectations for the archaeological work at the site? Xing Fulai: The unearthed artifacts from the Tongwancheng mainly include building materials, porcelains, stone-made building tools, stone buildings and pottery. The excavation area of the Tongwancheng site is small. There is still insufficient understanding of the roads outside the city, the streets within the city, the layout of the buildings, the water sources in the city and the cemeteries. Our knowledge about Tongwancheng will increase as the data collation and archaeological work continue.